Another Monday...Another Sketch from MJ to combine with my TJ Blogstravaganza posting! With a little over 2 weeks left in the TJ Blogstravaganza - I hope you've been inspired by my projects, I know I've gotten a considerable amount of Holiday Cards made! For today's post, I've managed to use some of my "neglected" stamps. I've always love using Lovely as a Tree for my Holiday cards - and I surely hope I don't see it on the retired list this week! Here I've used MJ's sketch - but created a 5" x 5" card, instead of my normal A2 sized cards. 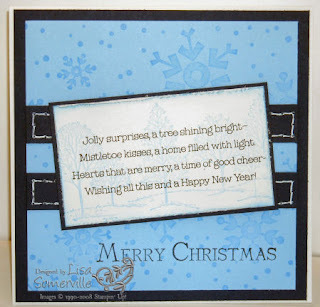 The sentiment from Many Merry Messages is stamped in black, then my Trees are stamped in Bashful Blue (that had been stamped off before stamping on my white card stock), edge panel with Bashful Blue Ink, then use the Distress Tool from the Cutter Kit to fray your edges. I used the Faux Stitching Technique on my Night of Navy strips, and wheeled the Snowflakes in Bashful Blue on Bashful Blue card stock. 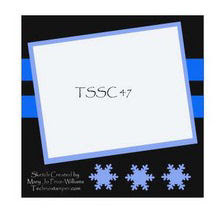 Where MJ had the snowflakes in her layout - I added my sentiment from Many Merry Messages. Here's MJ's original sketch if you'd like to play along. If uploading to any online galleries, please use keyword TSSC47. Another LOVELY card, Lisa. It's fun to dust off those old favorites too! That sentiment goes great with that set! Never would have thunk it, lol! Thanks for playing love the card. The subtle Lovely As a Tree in the background is wonderful. Great card!